London - as cruise destinations go, it's hard to beat! Cruise ships can head up the Thames and straight into the heart of the capital, offering their passengers an unforgettable experience, with unrivalled views of historic buildings and modern icons alike. 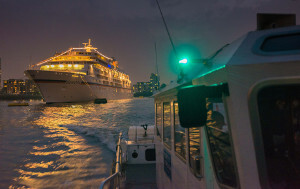 The Port of London Authority provides two moorings for cruise ships, one at Greenwich, the other at just upriver of Tower Bridge. Greenwich Ship Tier can accommodate vessels up to 228 metres in length and provides a stunning location close by the Naval College and in sight of the Cutty Sark. Vessels moored here are serviced through the world's first floating cruise terminal, PLA’s Welcome. 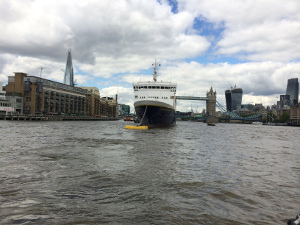 Tower Bridge Upper mooring caters for smaller, specialist vessels up to 158 metres in length, which enjoy sailing through Tower Bridge and tying up alongside HMS Belfast, directly opposite the Tower of London. The PLA also offers moorings suited for super yachts at George’s Stairs Tier (just below Tower Bridge) for vessels up to 110m and Mill Stairs Upper Tier (just above Cherry Garden Pier) for vessels up to 35m. Bookings for all PLA moorings are taken directly by the Harbour Master Upper’s team, who can be reached on 0207 743 7966. They can provide advice on all aspects of passage planning, mooring configuration and who to contact about provision of services.